After collecting HCP Heirloom Designation IX, what could the world’s most expensive chocolate perform for an encore? Something more elaborate of course. Aging chocolate. A subject of anecdotes & theories but no empirical data. It coincided with this site's own aging program which went up, literally, in flames hot enough to dry every tear that loss caused. Thankfully theirs came to fruition. To'ak ventures far outside the lab to come back deeper into it. The company enrolls university science departments for tantamount to a multi-phase clinical trial. No expense, distance or patience spared in the experiments. In generations to come, those still chronicling such matters should note: as Methuselah to humans, so To’ak to chocolate. A short-sided 4-day ferment prevents the Spanish elm frame from renting & ripping the flavor chamber apart which 1 year of aging could only ameliorate nonetheless to a degree. As is, a forceful yet subtle exposition. Below average climate conditions continued on into 2015 but above 2014 levels (see below) resulting in a sweeter vintage. Yet To'ak calibrates this at a sweeter level still -- 73%. A Laphroaig cask, at the deep end of peat. This 'peat monster' imposes & then some. Positively / absolutely identifiable from the jump. Chocolate subtantially sublimated in the process & secondary to it. Higher cacáo-content &/or shorter curing would balance the components. Notwithstanding, as is, the profile more than hangs together, it harmonizes throughout so by the aft-entrails it drifts toward a deep tonic mead. 2014 Vintage recorded less sun & rain producing abundant acids & tannins. To'ak compensated by extending the fermentation (6 days), shortening the conche (12 hours) with a moderate roast in between. 50+ year old oak cask from the Limousin forest in south-central France, most recently decanting eua-de-vie. Quecus patraea (Limousin) is hard but looser grained than the more common America oak. Its porous nature allows for more tannins to interact, thus imparts add’l flavors, including its own cocoa analogues. Very successful production. Influence of the cognac identifiable, even leading, & still restrained. Near perfect pitch in amplitude & magnitude. Singular &, despite the above descriptors, subdued. A conventional framework at the beginning & then end. In between however... anything but. Andean Alder (Alnus acuminata), a wild tree growing at mid-elevation in the Andes Mountains. Tannically rich. This bar emphasizes the 'wild' expression (nearly wildlife). But so unexpectedly unwooden save for the final frame. The middle procession thoroughly disorients & divorces from chocolate-flavor sense altogether. If not for the textural tether, this bar's midsection would fail a blindfold test. What it lacks in the way of enticements it makes up for by avoiding blandishments. For the person who thinks they've tried it all. The good folk at To’ak have really outdone themselves on this one because… well, they’ve only themselves to outdo, considering how this label set the standard for Bentley-like A-1 prime packaging & presentation in the craft chocolate space. Mast Bros. and Marou, elegant wallpaper notwithstanding, just Kleenex® by comparison. Yep, colored snot rags next to this polished Spanish elm box accoutered with tongs so nothing gets between your tongue & chocolate (well, almost nothing). To’ak & Co. in this quartet transmutes cacáo into deeper chocolate heights. Generalized polygamous shape-shifters of flavor. Similar mash-ups in craft chocolate go back years now – starting with Soma’s Niagara ice-wines and Raaka’s barrel stash among others. Even before them, the pronounced leanings of sapodilla wood used for fermentation boxes on then-Cotton Tree / now-Moho chocolate shaped flavor outcomes dramatically. 14 Manabí properties culled into post-harvest management by Servio Pachard. Then subjected to various aging protocols detailed in the accompanying booklet furnished with every package. Lots of good solid info. The cribs notes: up to three-quarters or more of a whiskey’s flavor derives from aging. 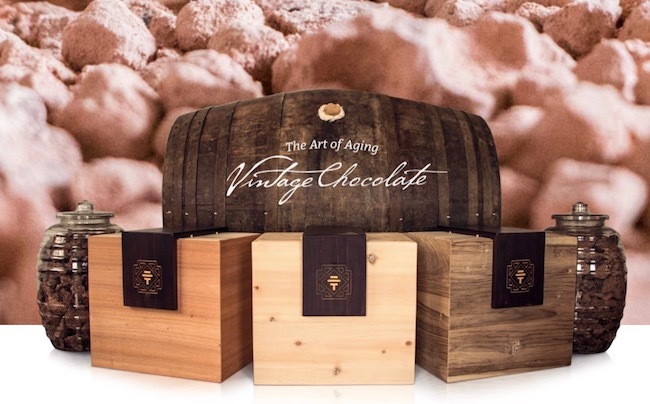 Depending on the cask, the tannins, lactones, sugars & other properties of wood interact with the bio-chemical compounds of the encased substance (in this case, chocolate). Make no mistake: these compounds reinforce that cacáo, though potent, remains fragile. Very impressionable & malleable. Consequently, it bears the brunt of these materials exerted upon it, to lie at service to them. While overpowering would overstate the effect, the profiles herein express for the most part the extrinsic factors -- the woods used in aging. Less about chocolate per se, more about the maker's mark.